Manage internal, supplier, and external audits. Record findings, observations, and resolutions. Link to CAPA's. Manage corrective, preventive and continuous improvement requests. Track detailed root-cause analysis and action plans. Perform verification. Capture, track and manage product or service issues. Prioritize, investigate, report, code, and trend complaints. Manage and track design projects through the lifecycle phases. Define and manage deliverables by phase. Maintain electronic Design History File (DHF). Submit, route, review/approve and implement electronic document changes and deviations. Manage electronic documents. Define, track and manage equipment, activities, and schedules. Manage calibration, maintenance and qualification activities, and unplanned (ad-hoc, repair) events. Identify, sort, track, tag and disposition nonconforming material. Review/approve proposed dispositions via the NCM Review Board (MRB). Manage disposition work. Review and approve suppliers. Manage the Approved Supplier List (ASL). Define, manage, and schedule supplier controls. 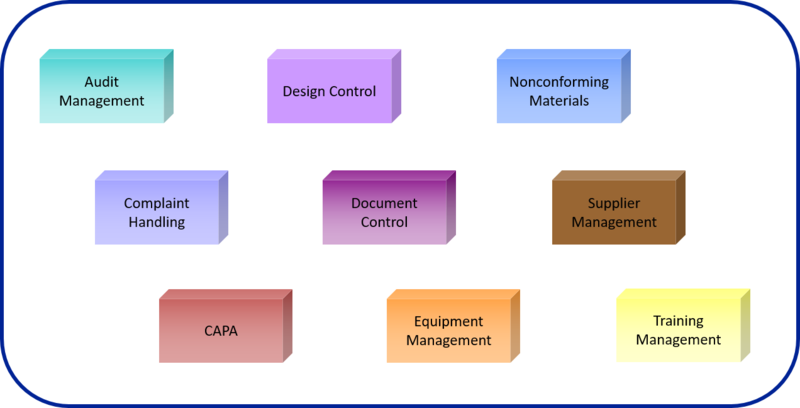 View summary of related CAPAs, Audits, and Nonconformances. Define and manage training requirements. Mark training complete. Authorize read and understand training. Certify a training requirement. Measure training effectiveness.